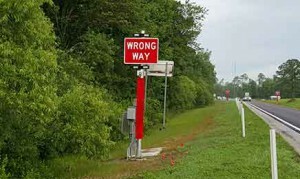 Phase 1 – Completed in May 2013, extensive research was conducted to determine the extent of the wrong-way driving problem and examine potential solutions. It was determined that no technology currently in use adequately addresses wrong-way driving. Texas had the best approach available. The manufacturer added a confirmation camera. Feasibility tests were conducted to determine the best technologies to implement. Testing began in January 2015 at the SR 528 / SR 520 Interchange. Additional testing sites were added at the SR 408 / Hiawassee Road Interchange and the SR 408/Kirkman Road Interchange for a total of 5 WWD pilot locations. Data from the test sites will be collected for the duration of the study. During the testing period, the system will be active and will alert the Regional Traffic Management Center (RTMC) if a wrong-way driver is detected. RTMC has a standard procedure that includes notifications to the Florida Highway Patrol. Phase 3 – Currently underway, in 2015 CFX received board approval to expand the pilot program to design and construct additional ramp locations on the CFX system. As of February 2017, an additional 29 ramp locations have had the WWD equipment installed. This brings the total to 34 ramp locations that are equipped with WWD countermeasures developed under this program. This includes locations on SR 408, SR 528, SR 417, SR 414 and SR 429.